How many Boston Marathon finishers actually re-qualify for the following year with their finish time on the Boston course? 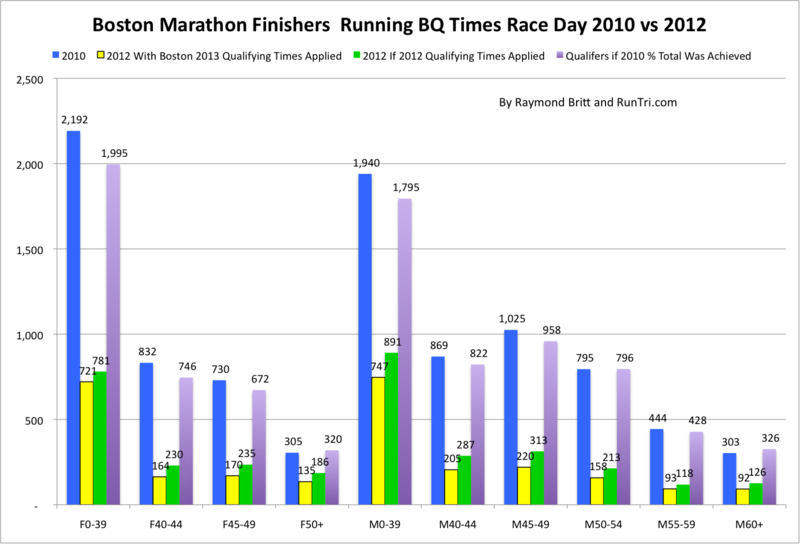 In the past, about 40+% of Boston finishers ran a time fast enough to qualify for the following year. But in 2012's brutally hot conditions, and with a new, more challenging qualifying limits, hopes of re-qualifying died for most by the time temperatures hit 80 degrees. Boston Marathon 2012: 13% of finishers re-qualified for Boston 2013 during the race. 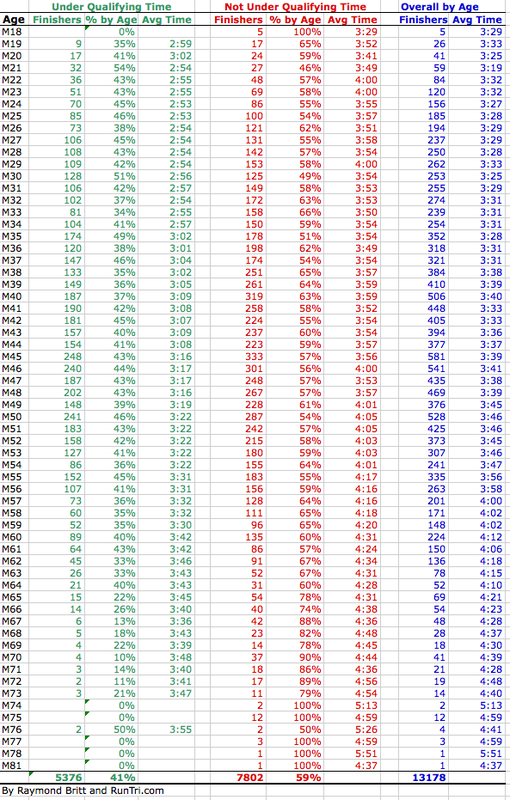 How much of the difference in 2012 was weather related vs new qualifying times? Most of the difference was due to the weather, not unexpected in a race that resulted in an average finish time of 4:18, a full 28 minutes slower than in 2010. 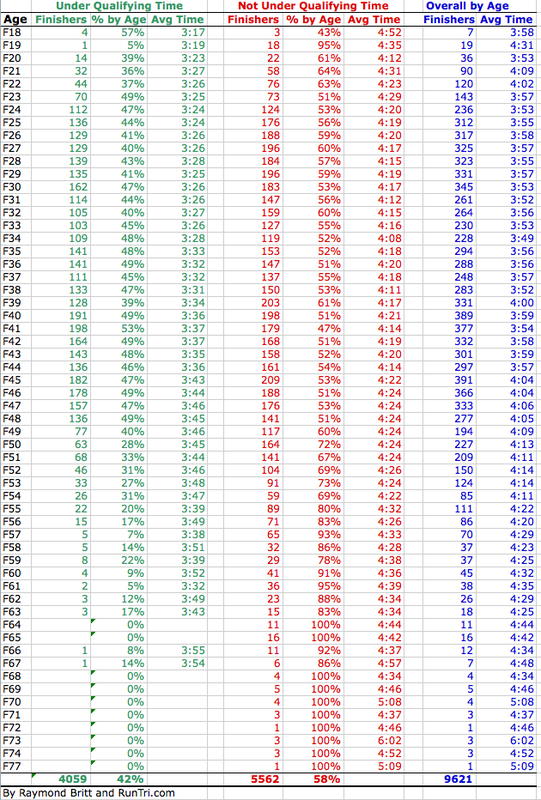 We wondered how many additional 2012 finishers might have qualified without changes to the 2013 qualifying times; the result, shown in the green bars above, barely moved the needle, from 13% to 16%. In most years since 1996 (with 3 exceptions: heat in 2004 and 2012, and near-nor'easter storm conditions in 2007), conditions have been far more hospitable. So our analysis of 2010's re-qualifiers at Boston is more in line with what's to be expected. Boston Marathon 2010: 41% of all Boston finishers re-qualified at the Boston Marathon. 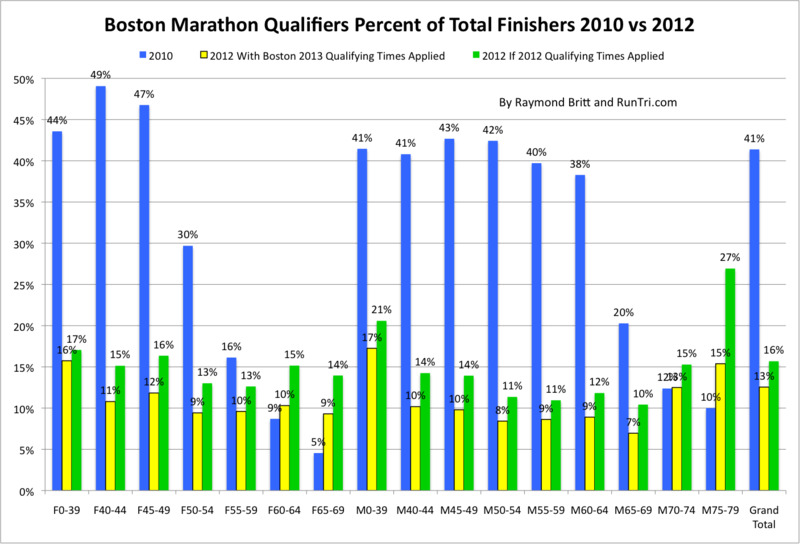 We analyzed the complete results of 22,800 finishers of the 2010 Boston Marathon, and found that only 42% qualified for Boston, at Boston. The remaining 58% ran slower than the qualifying standard that they had met to get to Boston in the first place. 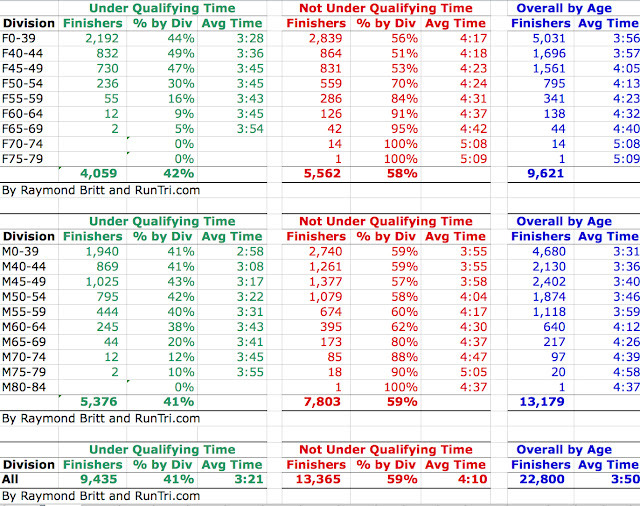 Of course, the data vary slightly by race division and by age, so we've run the numbers, and here are the results of those who qualified for Boston at Boston, and those who did not, along with the average times by division or group. For more, see our complete Boston Marathon Coverage and Qualifying for Boston.